Wonderful rain low colouring, interesting to hear about the pink dot symbol and reasons for it in your area. You may be across the world from America with different symbols, but both sides of the globe are wanting the same thing - to have an open and inclusive society that supports everyone. I really do hope that everyone starts to open their hearts and see that we're not all that different afterall. 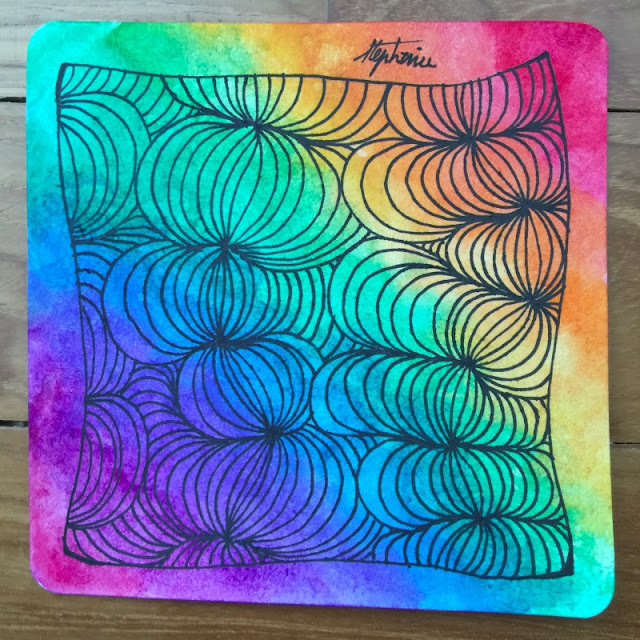 What did you use to color your tile? The colors are vibrant, but blend so nicely and are a good base for your monotangle. In the US, the LGBT community still faces problems, especially in some states and rural areas. However, the times are inexorably changing and fortunately, the younger generation seems much more accepting of diversity in our communities. In the US, pink is usually the color associated with breast cancer awareness and as you mentioned, the rainbow flag is the symbol of LGBT pride and support. I used Winsor & Newton's Cotman watercolours. Singapore is actually considered a conservative country. We have a law that states that homesexual activities are illegal. That law is something that the Pink Dot supporters want to abolish. There are also opposing religious groups that host a "White Dot" event on the same day as the Pink Dot event... So it's not all acceptance and love.... We, too, are struggling for equal rights for all. I like this monotangle with all it's colors. This is so striking! The colors are so vibrant, and you've unified everything in one tangle...very good, diversity within unity. Love it!